We are bringing the mobile NYE party to Atlanta to ring in 2017! Now you have the chance to party in multiple bar districts with our Limo bus crawl from Virginia Highlands to Morningside in Atlanta. Get driven around in style on our limo party bus with LED lighting, Limo style sofas, dancefloor, drinks and a 2000w sound system playing party tracks all night long. So the party doesn’t have to stop while you cruise you around from bar to bar. 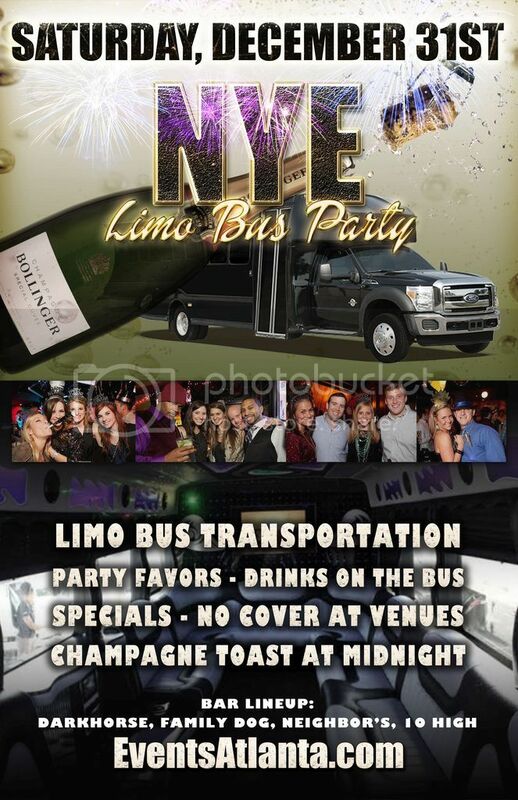 NYE Limo bus party crawl works with moving you around to 4 bars from Virginia Highlands to Morningside offering food & drink specials. We provide multiple shared limo buses, beer & wine on the buses, $5 gift card, party favors, security on the buses ensure buses stay for the group and more! Buses will be leaving every 15-20 minutes running back and forth between the venues. There is only limited number spaces that will be available for the event. **All Guests Must Be 21+ with ID. Don't drink and drive take taxi, uber, lyft or car service to and from event. No Refunds. Price subject to change.